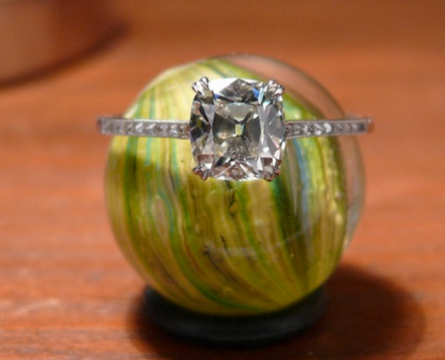 Jokes apart, I just made my first online purchase from an ebay seller and I am not quite sure I want to keep the stone. I know there are quite a few well known sellers out there (AJS, Wildfish, GemFix, Awesome Gems, etc.) but somehow I could not find the right combination of price and quality. I found this 1.33ct GIA certified ruby which I bought for USD 2.5k after some bargaining. - Do you think I overpaid? - Would you recommend a specific online seller? Size I am interested in is 1 - 1.5 ct. - as close to vivid red as it gets, heat treatment is no problem (I don’t even bother with unheated stones, too expensive for the quality I seek). If it’s misrepresented, I would return it. eBay has a fairly decent return policy that it’s vendors are beholden to. I would check ebay’s return rules, and I would slso ask the seller to initiate a refund. Unfortunately, with Burma rubies, you get what you pay for. Any lightly treated, vivid red stone, slightly above a carat, will run you north of $10k. Don’t even ask about untreated, clean, vivid red Certified Burma rubies, as the sky is the limit in those if you can find one (most are inferior color even if they are Burmese). I know this vendor is very flexible about allowing returns. I'm interested to see pics of what it looks like IRL. Rfisher, rockysalamander and TheGarnetGirl like this. @lovedogs I got the same impression but wanted to get some input before I initiate the return/refund process. I will try to get some pictures tomorrow! I’ve seen a couple of nice stones at AJS for USD 1-2k but I fear they will be pretty similar in terms of color. Any thoughts? rockysalamander and lovedogs like this. AJS isn’t known for the most vendor accurate photography. Unfortunately, rubies are among the most expensive, and difficult colored gems to purchase. You can pay thousands of dollars and still have a stone lacking in color and/or clarity, as well as size, and various forms of invasive clarity and color enhancement. If you are someone who demands vivid color in your gems, I would probably abandon the search for a ruby, and look to alternative stones, Ruby is the one gemstone I do not own because of these reasons. I’m very picky when it comes to red gems. There are some people on this forum that have very beautiful rubies, and one of my PS friends has a ruby ring with a gorgeous African ruby. It was still very expensive, but the Burma locale always has a much higher premium. If you want a vivid red stone that won't totally destroy the bank, I'd suggest spinel instead of Ruby. I just got an amazing red spinel because I was looking for "stop light red" without going over 2k for a stone. So that's another thing to look at! Tekate, rockysalamander and MissyBeaucoup like this. Vendors obviously portray their gems in the best lighting conditions possible, unfortunately these lighting conditions aren’t what you’ll be seeing or wearing the gem in. Also keep in mind that once loose gems are set they “darken” further. It’s best to buy from vendors who offer “no problem return for full refund” policy and also ask for photos in normal lighting conditions. Burmese rubies are the “be all to end all” and a superb unheated Burmese Ruby is a sight to behold, however the gems are rare and unbelievably expensive. You need to buy from rock solid reliable vendors or buy with a rock solid lab report to avoid inappropriate enhancements (glass filling / beryllium treatment). Irrespective of origin and acceptable treatment (heat only) a ruby over 1 carat of good transparency and a proper “Ruby red” colour is going to start at around $3,000 a carat AND be hard to find. You might like to look at Spinel or even Rubellite Tourmaline, both these gems come in a beautiful red colour but without the eye watering price tag. VividRed, rockysalamander and MissyBeaucoup like this. Even when I was in Mogok last month, I hardly saw any faceted ruby for sale in the local markets. Since most legal mining concessions have ended. So prices are skyrocketing as I type owing to the lack of supply. suzanne2, rockysalamander and MissyBeaucoup like this. I'd dare ask good people I know nothing about - WWW to go through a reasuring third party - WWW. Have noticed reds over time at http://www.americanthai.com - you will have to ask what is available. Tekate, suzanne2 and VividRed like this. I prefer the purple red to the stoplight red so the vendor pics of your stone look really lovely to me. Tekate, VividRed, lovedogs and 1 other person like this. Thank you all very much for your answers and advice! I am not in a hurry to find the right stone and I certainly will look into red spinel too. @MissyBeaucoup: The picture from the vendor looks very nice indeed, I can live with some purple/pink for that price. Sadly the stone looks very different IRL. Classic Mogok rubies are purplish red not stop light red. is the stone clean? Is it well cut? My only concern is the residue. What is it? The heat doesn't bother me. The major labs do not uphold° standard colour denominations for ruby (or anything else) as is done for diamonds. GRS paper is highly respected, but... I would not worry about the BP label nearly as much as about my own preference. Many GRS BP seem darn' dark; many rubies without this baggage are obviously remarcable. It is nice to see some good stuff in person. I am curious about this: www - a lighter vivid red is so unusual, I'd be needing all those words to name the colour. One more: www - the pictures could be better. Here are some pictures - missed the best time if the day but all are still shown in daylight (skylight to be precise). This is as good as it gets, indoor is another story. Tekate, Acinom, AV_ and 1 other person like this. Just posted a few pics! Hi MJO - there are a few inclusions visible at 10x magnification plus an eye visible one just below the table. Cut is good and polish also good, depth maybe a bit on the upper end which might be the cause of the stone being a little too dark. My personal opinion is if the stone looks dark purple indoors I would return it and find a ruby that looks good in all normal lighting conditions. Don't settle for a stone that does not look attractive indoors. mrs-b, MissyBeaucoup, voce and 2 others like this. And here some indoor pictures - the stone is inundated with incandescent light. Clearly there is a fair amount of brilliance but it just looks a bit too pink to me. MissSarah, AV_ and lovedogs like this. I love it, but imho it looks more like a rubellite than Ruby, so I wouldn't want to pay Ruby price for it. In the pictures it looks like a hot pink sapphire to me. It appears a vivid pink, not vivid red. Since you are set on a vivid red, you'd have to go with spinel maybe to keep it more affordable. Personally, I think that even if Burma produces the best rubies, not all Burmese rubies exhibit the traits of the best of the species, and that you should evaluate each stone on its own merit. If it looks too purplish to be pleasing to you, then it's time to return it. Don't hang on to it just by virtue of "this is a good deal because the ruby origin is Burmese." Tekate, MissyBeaucoup, VividRed and 1 other person like this. Does it fluoresce in the sun or under UV light? I think it is a pretty stone. I didn't look at what you paid for it. That said you don't seem happy with how pink it is indoors, and gemstones are often either you love it or don't kind of thing. I am not really sure to be honest, it sometimes seems to lighten up a bit in sunlight but that might also just be the light bouncing inside the stone. It is supposed to be very visible? I think so too, it is indeed a pretty stone. I’m just not really sold. I think I will return it. Tekate, Lykame and lovedogs like this. In good stones, yes. Higher quality rubies and red spinels should go even more vivid red in sunlight due to this ability. I once had a red spinel that I returned because while it did fluoresce under very strong artificial UV light, it didn’t in sunlight. My other red and pink spinels shows up with a more vivid red in sunlight. For 2.5k you need to LOVE it. So I definitely think you should return. Tekate, Lykame, leukolenos and 1 other person like this. You may need to ask for options without a noticeable purple modifier. Quick update: I returned the stone. It was a beautiful piece but not the one I was looking for. The search continues. Thank you all for your contribution and advice, I started looking at red spinels too but honestly cannot say the price is significantly lower than ruby at 1-1.5 carat if the color is right - so far, I found it to it to be on par with good quality heated Red rubies, and somehow harder to find. Tekate, Lykame, MissSarah and 2 others like this. To me this is the perfect red color spinel but it does have an inclusion.